Che Thai is a Vietnamese interpretation of a Thai dessert. 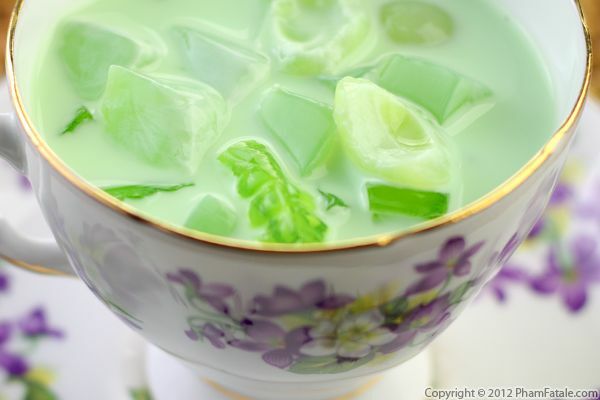 It's made of a combination of coconut milk, half and half and pandan flavorings. This makes the base of the dessert, the rest is up to you. I usually add whatever I have available; it can be fresh jackfruit, longans, lychees, pomegranate seeds or agar agar jelly. I have a funny anecdote about this dessert. When I first introduced it to my husband's family, everyone was very pleased and surprised by how refreshing it tasted, especially Lulu's uncle, Ibbu Mamu. It was a really hot summer day and I can still picture him, eating cup after cup of che Thai. At some point, he asked for the recipe. "Jackie, I love this dessert, it's so light and refreshing". After I listed off the ingredients though, he kind of freaked out, seeing as he had just polished off two very large cups!